Kick off VfB Stuttgart-FSV Mainz in 1. Bundesliga on today 14:30. Referee in the match will be Tobias Stieler. Team VfB Stuttgart is in the releagtion zone of the table. 16 position. Form team looks like this: In the last 5 matches (league + cup) gain 6 points. 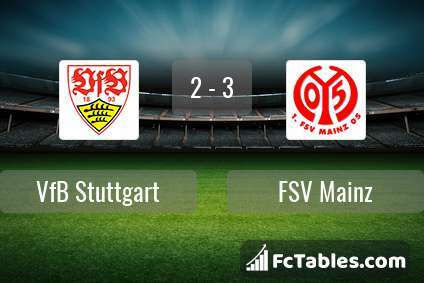 VfB Stuttgart from 2 matches can not beat any rival. 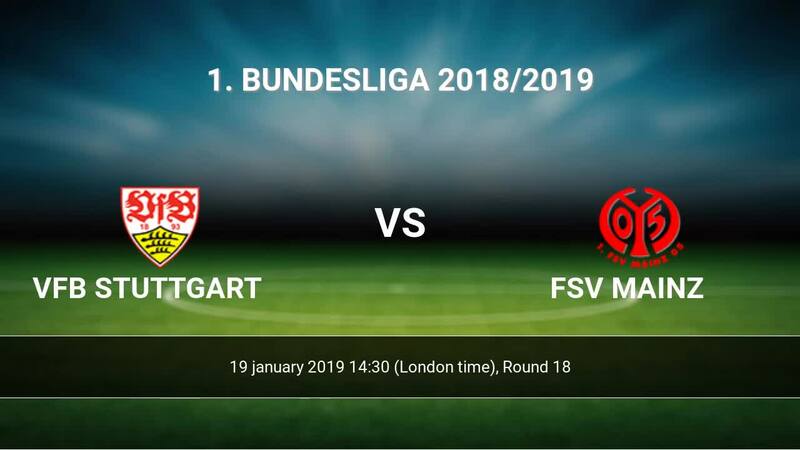 To defend FSV Mainz the most demanding players will be Mario Gomez 5 goals, Anastasios Donis 2 goals, Emiliano Insua 1 goals, because this season they scored the most goals for VfB Stuttgart of the entire composition. Most goals developed: Mario Gomez 1 assists, Emiliano Insua 1 assists. Injuries in the team VfB Stuttgart: Benjamin Pavard, Alexander Meyer, Hans Nunoo Sarpei. Team FSV Mainz is located in the middle of the table. (12 place). FSV Mainz in 5 last matches (league + cup) have collected6 points. FSV Mainz from 4 matches can not beat any rival. From 2 matches no lost a match. Players FSV Mainz in 1. Bundesliga with the highest number of goals: Jean-Philippe Mateta 5 goals, Robin Quaison 3 goals, Anthony Ujah 2 goals. Players Jean-Philippe Mateta 1 assists, Robin Quaison 2 assists will have to be very well guarded by defenders VfB Stuttgart, because they have the most assists. Injuries in the team FSV Mainz: Rene Adler, Danny Latza, Emil Berggreen, Karim Onisiwo, Jonathan Burkardt. Direct matches: usually ended with winning of VfB Stuttgart. 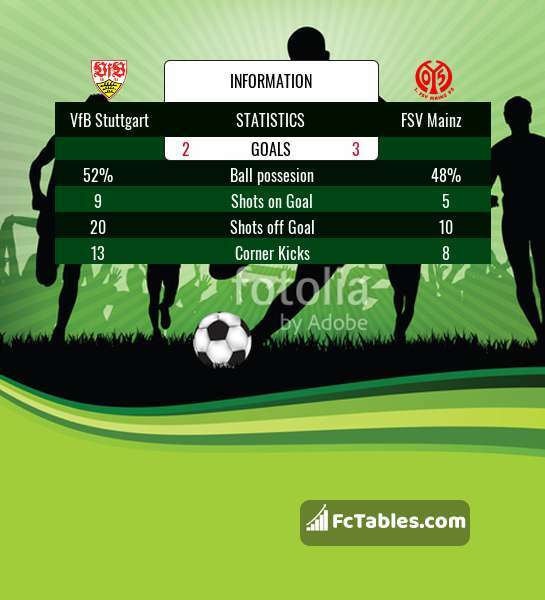 Balace of both teams games are: 10 won VfB Stuttgart, 9 wins FSV Mainz, 6 draws. In 15 matches the sum of the goals both teams was greater than 2.5 (Over 2.5). On the other hand, 20 matches teams scored more than 1.5 goals (Over 1.5). In 17 matches the both teams have shot at least one goal.